« Does it Make Sense to Have Departmental or Agency Websites? That’s a lot of different numbers, but basically it boils down to this: the Twitter experience is transforming into a mobile one. How I tweet. 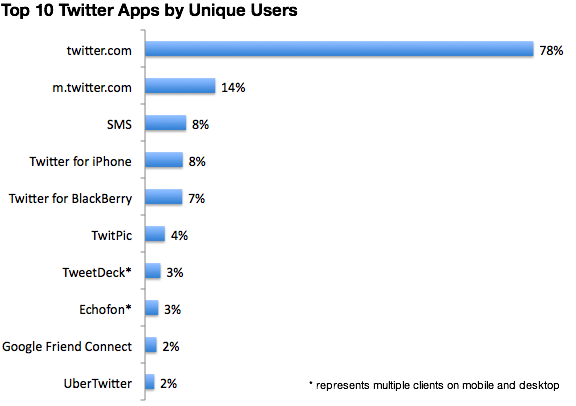 Mobile clients highlighted. Importantly, I’m not just issuing and reading tweets via mobile. I’m following links. Lots of them. As we all know link sharing is one of the most common ways of using Twitter. And I can tell you that when I get to the other end of those links, I much prefer dealing with site that’s optimized for mobile than one that’s not. I’m sure I’m not the only one. What’s the takeaway for us GoC web communications types? If you are running a Twitter account that posts links to your website into the Twitterverse (and soon that’ll be all of us), it looks like its time to start thinking about taking your website mobile if you haven’t already.